Fifth grade Lesson Experiment: Does the height of a ramp affect the distance a toy car travels? SWBAT work through the steps of the scientific method to test how the height of a ramp affects the distance a toy car travels. Students test their hypothesis to find out if increasing the height of a ramp will cause a toy car to travel farther. Students are working through the steps of the scientific method to test a hypothesis. In doing so, they are identifying and controlling variables, and building scientific thinking skills. This lesson is directly linked to standard 3-5-ETS1-3: Plan and carry out fair tests in which variables are controlled and failure points are considered to identify aspects of a model or prototype that can be improved. Although it is not the direct focus of this lesson, the force of gravity and friction are also addressed. This provides students with some background knowledge that will help them connect to new knowledge later in the year when we cover standard 5-PS2-1 on gravity. Students will work through the steps of the scientific method to test their hypothesis on whether increasing the height of a ramp will cause the car to move a greater distance. They will demonstrate an understanding of controlling variables in the experiment and how to collect and record precise data. I will assess students mastery through formative assessment while observing them while conducting the experiment and through the data they collect. These items will be used to demonstrate what happens as students observe, and will lead to students developing a testable question for how to make the car travel farther. Print out the Experiment steps for the ramp experiment or the Procedure for ramp experiment for each student depending on need in your class. I have a ramp set up in the middle of the classroom. It is set up with 3 textbooks at one end of a wooden ramp. I ask students to predict what will happen if I set a toy car at the top and let it go. All students agree the car will go down the ramp. I demonstrate this for them and show them that they are correct, the car rolled down the ramp. I tell them that I want to try and get the car to travel further, all the way across the room if I can. I ask for ideas on how I can do this without changing the car, or the force used to move the car. I ask students to tell me what force is responsible for the motion of the car and they know it is gravity. I provide students with the opportunity to try and think of things to change themselves because it promotes science thinking, and it leads to testable questions. Students begin giving ideas on ways to get the car to travel farther. They tell me to wax the surface of the wood to make it more slippery. I use this teachable moment to discuss friction for a minute. They tell me to raise the ramp. They also tell me to add a fan behind the car and we talk about how that changes the force causing the motion so we can’t do that. I tell them that we will test to see if raising the height of the ramp affects the distance the car travels today. We will test how changing the surface affects the car later in the year (I already have this experiment planned for the unit on forces and motion but when it comes time they will think they came up with it). I provide each student with a piece of copy paper already trifolded and ask them to glue it in their science notebook. I have the same foldable glued in my notebook on the overhead. I record the question for the experiment in the upper left corner of the foldable: Does increasing the height of a ramp affect the distance a toy car travels? Students copy this down. I always model in my notebook what I want them to do in theirs because it provides an example for those who need the visual. It also gives me something to reference later in the year. I provide some students with all of the experiment steps for the ramp experiment typed out and others with only the procedure for ramp experiment. I have students who struggle with copying information neatly and quickly, and others who have a difficult time focusing on discussion when copying. To help these students stay focused on our discussion, I provide them with all of the steps typed out, cut, and put in a baggie so the steps are out of order. This at least makes them read the steps and figure out the correct order. This also helps promote participation from these students because they are able to listen to the discussion and focus on the questions being asked. All other students who are able to copy are provided with only the procedure to the experiment typed out, as this contains many steps and takes a long time to record. We complete our foldable adding in each step as we discuss it. When we get to the steps of the procedure, we review how to make precise measurements and I have 2 students come model for us. I ask them where they will begin measuring from and they say the back of the ramp (which would be the back of the car). I ask them where they will stop measuring and they say the back of the car. After they demonstrate measuring the distance traveled, I ask a few other students to repeat where we will all measuring from just to clarify the directions. We identify all variables in the experiment and record them in our notebook as well. After our foldable is set up, we draw a data chart in the center of the foldable to collect data in during the experiment. Students draw a rectangle and separate it into four columns, one for each trial, and four rows, one for each height. I ask a student to repeat the steps of the procedure for me so the procedure is fresh in everyone’s mind. I assign an area of the room to each group. I show each group where to set up their ramp, and in what direction their cars should be going. As groups begin testing their hypothesis, I circulate to observe and make sure students are following the correct steps and measuring correctly. I model the proper measuring techniques for any group that is struggling. The biggest struggle I noticed with measuring was going straight to the car, several groups were wanting to pull the measuring tape straight and then drag their finger over to line it up with the car. I had to discuss how this left room for error. As I circulate, I also remind students that they should have a unit recorded for their measurement, not just a number. This is something that many students forget. In this video of students conducting ramp experiment, the students follow the correct procedure by releasing the car without applying force. All three group members are actively participating, none is sitting back watching while two measure. They also measure accurately by marking their finger on the floor and not moving it while extending the measuring tape. This groups does slide the measuring tape over to line it up next to the car tires but I stopped the recording before that can be seen. They do not make the common error of leaving the measuring tape straight and dragging their finger over to line it up with the car. When students complete all three trials of the experiment, they clean up their materials and put them back on the table. They return to their seats to analyze their data and write their conclusion. I also have them draw a model of the experiment on the outside of their foldable and label what is happening. This continues to review models with them and requires them to explain in science terms what was happening in the experiment. When all groups are finished, or time is up, we share the conclusion each group came up with. We discuss any differences and come up with factors that could have affected the outcome for those groups. There were very few differences in outcomes. Each group found that the distance the car traveled increased as the height of the ramp increased. The car traveled the least distance with three books and the greatest distance with the five books. The biggest difference noted by students was the differences between the distances traveled. Some groups had very small differences of only about 12 - 20 cm. Other groups had much larger differences between distances at the different ramp heights such as 40 - 50 cm. I asked students for their thoughts on what could have caused this. One response I got was that students may have added force when releasing the car, which is evident in the video of student who uses force that I was able to record. Another thought on what affected the outcome was that the area of the floor where one group tested may have been dirtier and slowed down the car causing it to travel a shorter distance in all trials. 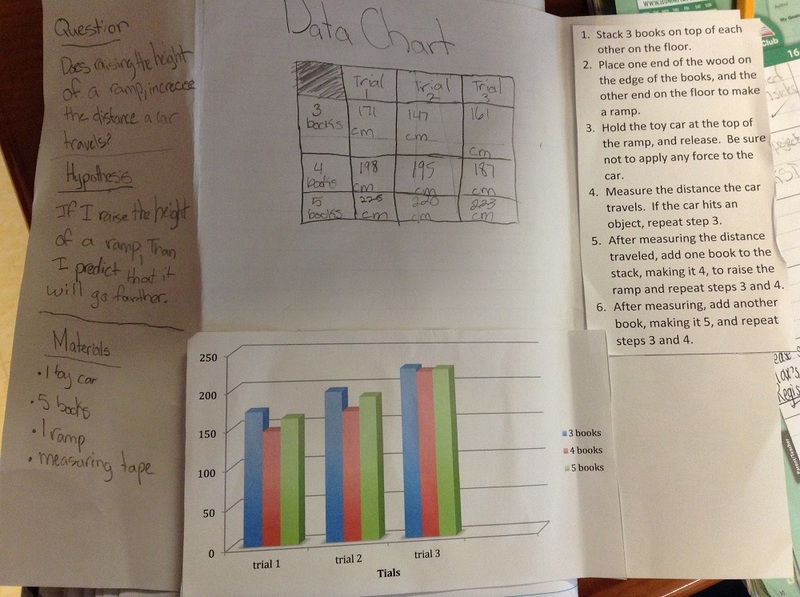 Students’ homework is to create a bar graph to illustrate their data from the experiment. I select a couple to share the following day.